Ted Nugent wrote a brilliant article in The Washington Times on July 30th, and I just had to share. Basically he tells us that we are all to blame for all the subversive policies that Obama has brought to our government. We had a duty to be vigilante about the people we elected to office and despite all the warning signs that were there as Obama campaigned and charmed his way into the Oval Office, we chose to ignore each and every one of them. He blames Americans for shrugging their duty simply because they felt apathetic about government. As he wrote: “We all saw it coming, but political correctness caused most of us to clam up in the ridiculous mindset that it was more important to avoid hurting feelings than to stand up for what we knew in our hearts was being trampled underfoot. Sadly, America has become a nation of ultra-thin-skinned, whining little girls, afraid of our own shadows and so cowardly as to back away from the simple solution of speaking the truth when we know we are supposed to do so. Finally, he ends by asking if “have learned our lesson that we the people have a daily, moral responsibility to be suspicious of everyone in government and the media and watchdog them properly from now on? Will we finally never forget? Will we finally say never again and mean it? His purpose, of course, is to jump-start decent Americans into taking responsibility for their complicit conduct in the train wreck or perhaps runaway train we now have as a central government. He urges people to join the TEA Party which is the best chance of undoing the wrongs and errors we’ve committed to get us in the Socialist-Marxist mess we are in now. As Nugent says: “Look at Harry Reid. Charlie Rangel. Listen to Nancy Pelosi. What kind of idiots do they represent? A huge army of idiots who wish to do nothing for their country, but whine for their government to do everything for them. Welcome to France, ladies and gentlemen, only worse. The Tea Party is a better-late-than-never step in the right direction back to the glorious “We the People” experiment in self-government, but as far as I’m concerned, we haven’t begun to turn up the heat nearly enough quite yet. 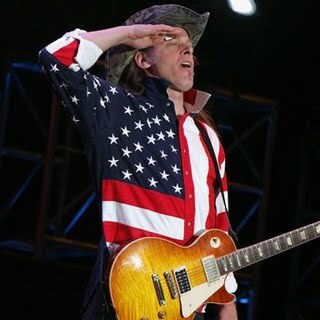 Please go read Ted Nugent’s article and share it with friends and family and neighbors and co-workers. I am more excited than ever now to see him at the “Restoring Honor” Rally in DC on the 28th of this month.